Following on from our watersports feature in the last issue Paul Zamitt Cutajar relates the story of his visit to the South Pacific surf beast, affectionately nicknamed 'Chopes'. 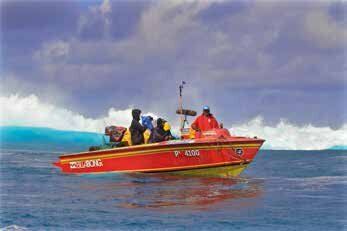 The Billabong Pro Teahupoo competition is not for the faint hearted as it involves considerable danger for the surfers, the rescue crews, the skippers and the media who brave the elements. With an extremely shallow shoreline and razor-knife coral, it can result in serious injuries, if not death. This then is one of the world’s heaviest big wave competitions and suited only to experienced surfers in peak physical condition. The event grabbed everyone's attention from the start and before long, the big wave surfing elite were arriving in Tahiti to compete.